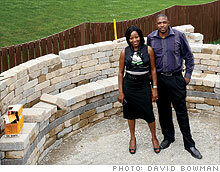 With no employees and shattered sales, a home contractor retools to outlast the recession. Isabel and Duane Draughon, owners of PaverStone Design Group. PaverStone's quality craftsmanship got the company off to a good start. POWELL, Ohio (Fortune Small Business) -- Semper fidelis, the U.S. Marine Corps motto, means "always faithful" in Latin. As a young grunt serving at Camp Lejeune, N.C., Duane Draughon learned to remain loyal to the mission -- "whatever the cost," he says. That mind-set has guided him since he left the Corps in 1997. "It's probably the only reason I've survived in business," says Draughon, who served as a police sergeant in the Marines and now owns a patio-paving company outside Columbus, Ohio. "I will never, ever give up." He's been tested -- almost to the breaking point. In 2005, after a stint selling cars, he started PaverStone Design Group. Launched during a national home-improvement boom, PaverStone was an instant success, designing and building lavish patios for affluent suburban homeowners in Columbus. To keep costs low, Draughon initially used prison inmates in a work-release program as laborers; later he hired and trained his own crews, mostly made up of immigrants from Mexico (all of them documented, he says). Revenues topped $500,000 in 2006. Draughon had a new business, a new house and a new car, plus a new baby -- his third with his wife, Isabel. Draughon's partner abruptly left the company in 2006, depriving PaverStone of a talented salesperson and a capable crew chief. Draughon admits that in trying to juggle a busy operation and manage the finances of his fast-growing business, he let costs spiral out of control. Soon he was broke -- and desperate. So the entrepreneur doubled down, betting everything he had on PaverStone. Draughon began rebuilding the business one brick at a time. He worked out payment plans with creditors. In addition, he persuaded his wife to quit her $45,000-a-year job as a mortgage broker to take over PaverStone's marketing and bookkeeping so that he could spend more time closing deals and supervising his crews. But in the summer of 2008, the Great Recession hit Columbus. To keep the business afloat, the Draughons pared expenses and laid off all five of their employees (the couple now hire subcontractors as needed). Orders trickled in during the summer and fall of 2009 -- enough to cover the utility bills and some other expenses -- but most projects have been much smaller than those the company handled before the economic downturn. "Customers used to dip into home equity to build huge patios with fireplaces, kitchens and special lighting for $30,000 or $40,000," Draughon recalls, shaking his head in frustration. "Now all they want is a rectangle for $5,000." The Draughons foresee a rebound in the local home-improvement market -- perhaps in the spring of 2010 -- and they want to be prepared to grow the business rapidly when it comes. But the Draughons know their company needs a stronger foundation. The couple seek a marketing strategy that maximizes their network of loyal customers and a more conservative financial plan to help them weather the vagaries of the real estate market. They also have questions about basic business practices. How can they find trustworthy lawyers and accountants? How should they negotiate better terms with suppliers? To assist them in mapping out a plan, Fortune Small Business brought three Makeover experts to the company's spartan offices in an industrial park in Powell. First up is Maureen Metcalf, 45, founder of management consultancy Metcalf & Associates in Columbus. Metcalf has found that thanks to aggressive search-engine optimization, PaverStone's slick Web site is usually one of the first to pop up in a Google search for "patio design in Columbus." But it's almost too slick, Metcalf says. The site is loaded with stock photos, including an image found on countless Web sites of a young woman wearing a telephone headset who appears to be a national call-center representative. The Draughons explain that they wanted to appear well established and businesslike. But they agree that they may have gone overboard with the corporate look. "Many customers think we're part of a national franchise," says Isabel. "They don't understand that we're a family business. That really hurts. We've put our heart and soul into this company." Metcalf's prescription: Use the site to share PaverStone's story. Tell potential customers about Duane's childhood just a few blocks away from the city's meanest streets, and how Duane's father put him and his two brothers to work mowing lawns to keep them out of trouble. Add that Duane turned an after-school job into a $120,000-a-year landscaping business before joining the Marines. Later he returned home, married and established a patio-building business. "Finding reliable contractors is a nightmare for homeowners," Metcalf says. "You're a Marine veteran, a family man. You're trustworthy. You get the job done, on time. It's a compelling story." Metcalf also advises the couple to update the Web site with photos of themselves. Get rid of the stock images. Add testimonials from satisfied customers who have been photographed lounging or dining on their patios. Create a section that offers before-and-after shots of backyards transformed by PaverStone. "You're not just selling a paved patio," Metcalf says. "You're selling the idea of a beautiful place to relax with family and friends." FSB's next expert tackles the thorny topic of corporate finance. Michael Jokerst, 52, is a financial expert from CFO Leadership, a consultancy in Columbus. The Draughons tell him they were unprepared to manage the finances of their fast-growing company. Marketing and labor costs soared. Duane suspects that he underestimated his costs as he raced from one job to another to oversee construction, damaging the company's bottom line. 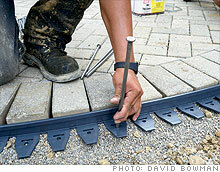 By the end of 2007, its busiest year to date, PaverStone owed $170,000 to suppliers. Bankruptcy loomed. Although the Draughons have since worked out a repayment plan with the suppliers, they worry about their ability to withstand the boom-and-bust cycles of the real estate business. "You've been using the 'big bucket' method of accounting," Jokerst says bluntly. "That's no way to run a business. You're pouring the money into a big bucket, taking out enough to cover your costs and hoping there's something left for you at the bottom of the bucket. That's dangerous." Instead, the Draughons should determine their true cost of doing business, considering everything the company needs, from paper clips to paving stones. In the past, Duane calculated fixed costs of supplies for each job, then added a general fee for overhead -- 42% in boom times, but currently as little as 10% -- based on a formula that a consultant suggested last year. "I suspect you aren't calculating the cost of your time," Jokerst says. Duane nods in agreement. "Sometimes I'm up all night creating a design proposal for a homeowner -- because I want that job," Duane says. Jokerst explains that not all projects will be profitable, especially now, as competitors trim their margins. "Calculate your costs to the penny," he tells the couple. "Or you could be working for nothing." Jokerst offers more tips to boost the company's bottom line. Negotiate better terms with suppliers, he urges. 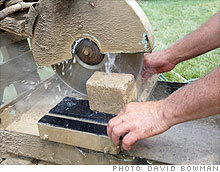 PaverStone has been paying cash for construction materials since its financial troubles in 2007. "After two years, you've proved your creditworthiness to suppliers," Jokerst tells Duane. "You've earned the right to request better terms -- 30 days, at least." Jokerst also recommends building a cash reserve during the busy spring and summer seasons to fund expenses during the slower winter months. Try to find a complementary business that would pull in needed revenue during the winter, he advises -- interior tiling, perhaps -- but be sure it's one that allows enough time to gear up for bidding on new projects in the spring. FSB's third expert, Nick Williams, 30, is a project manager with Definity Partners, a business consultancy in Columbus. Williams praises the Draughons' ability to survive a trial by fire during the past five years. "One of the hardest things is having no guidance," Duane confesses. "Lots of times I don't know where to turn with business questions. Isabel and I have each other, but it gets lonely. We really need to find some mentors." Duane says he's the one fielding calls from fledgling entrepreneurs within the African-American community in Columbus. Early on he sought help from a state-sponsored program for minority business owners, but "they treated me like a child," he recalls. "It was insulting." Like most cities, Columbus offers dozens of networking groups for small business owners. "You've just got to make the rounds to find the right fit," Williams says. Local chambers of commerce provide opportunities to meet other business folk, though the quality of the programs varies widely from town to town. And Isabel should join groups that cater to women's business development and leadership. Don't judge an organization after just one event; try to attend several, and then meet with the group's leaders to discuss their mission and your goals. Finding a mentor is a lot like dating, Williams says. "It could take a while to find that spark." But building a network of experienced advisers is essential. For example, mentors can provide valuable recommendations when you need a professional such as a lawyer or an accountant. Immediately after the Makeover, the Draughons began to implement some of our experts' advice. "The Makeover was a life-changing experience," Duane says. "We intend to come out of this downturn stronger than ever." The Draughons are updating their Web site with bios and photos, including one of Duane as a Marine. Duane is assessing bids more carefully, trying to factor in the time he'll spend designing and overseeing each project. Every Friday, the couple review a financial report to monitor cash flow. This fall, they plan to attend several events sponsored by local business groups in the hope of building relationships with other entrepreneurs.